Once upon a time, a fox was walking in the forest. It was a very hot day, so he felt thirsty. He looked around to see if he could find some water. At some distance, he saw a well. So he went there to drink water. Since he was very thirsty, without seeing how deep the well was, the fox jumped into the well to drink water. 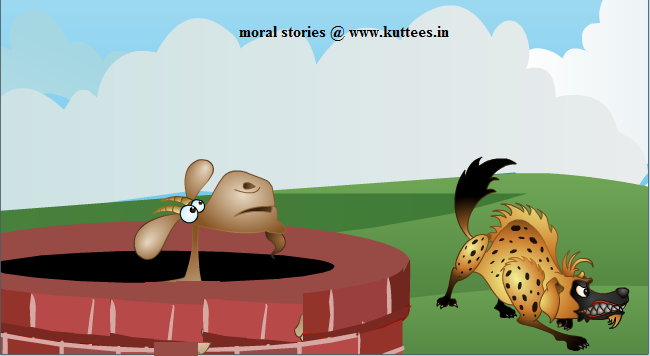 Only after drinking the water, he realized that he couldn't climb back from the well. He was very sad, not knowing how to come out. Just then he saw an innocent goat passing near that well. Immediately some idea flashed in his mind. He called the goat and told him, "Dear friend, come here. The water inside this well is very sweet. You should also taste it"
The stupid Goat didn't think about the plan of the fox. The goat also jumped inside the well. Immediately, the fox climbed on his back and came out of the well. The poor goat didn't know what was happening. Before he could realize that he was cheated, the fox ran away from that place. MORAL : Look before you leap.